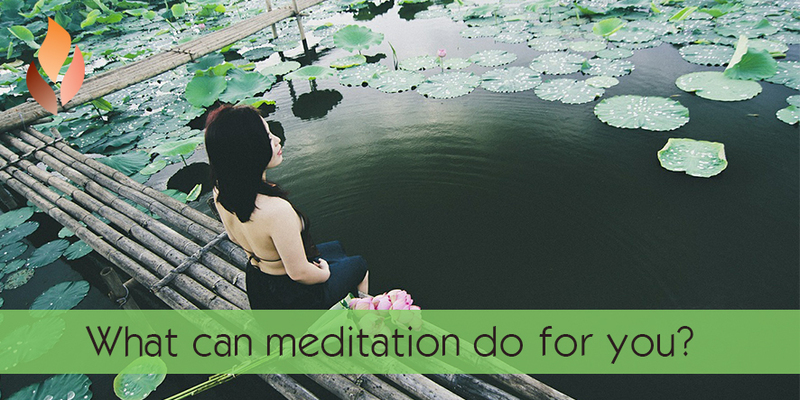 Home » Events and Blogs » Blog » What can meditation do for you? While the modern-day science behind this age-old practice is still developing, plenty of studies suggest that meditation is about way more than blissing out — take a look at some of the possible benefits below, and scroll down for more information on each. Researchers speculate that those who practice meditation develop the ability to exert greater control over unpleasant feelings, including pain, by turning them down as if using a “volume knob” in the brain. Lowers blood pressure. A study co-directed by Dr. Randy Zusman at Massachusetts General Hospital took patients being treated with typical high blood pressure medication and taught them a technique called the relaxation response; more than half experienced a drop in blood pressure, sometimes even resulting in reduced medication, NPR reported. “I’d been using medications in these patients, they were hopefully following my recommendations,” Zusman told NPR. “[But] we still couldn’t get their blood pressure under control. And I was somewhat skeptical that meditation could be the key to blood pressure control.” What’s more, the Mayo Clinic reports that research suggests meditation could be helpful in managing the symptoms of high blood pressure. Eases inflammation. In 2013 research at the University of Wisconsin-Madison and the Center for Investigating Healthy Minds in the Waisman Center, scientists identified a possible tie between mindfulness meditation and the relief of inflammatory symptoms among people who suffer from chronic inflammatory conditions. “This is not a cure-all, but our study does show that there are specific ways that mindfulness can be beneficial, and that there are specific people who may be more likely to benefit from this approach than other interventions,” lead author Melissa Rosenkranz said in a statement. Reduces heart risk. A 2012 study published in the journal Circulation: Cardiovascular Quality and Outcomes showed a link between Transcendental Mediation and a reduction in heart attack, stroke and early death from heart disease in a group of African Americans, TIME reported. “The main finding [of our research] is that, added on top of usual medical care, intervention with a mind-body technique — transcendental meditation — can have a major effect on cardiovascular events,” lead author Robert Schneider, a professor at the Maharishi University of Management, told the publication. The American Heart Association also says that the stress-busting benefits of different types of meditation can be a boon to heart health. Meditation training improves a wide range of willpower skills, including attention, focus, stress management, impulse control and self-awareness. It changes both the function and structure of the brain to support self-control. For example, regular meditators have more gray matter in the prefrontal cortex. And it doesn’t take a lifetime of practice — brain changes have been observed after eight weeks of brief daily meditation training. Boosts cognitive function. Another Psychological Science study identified a link between mindfulness training and increased standardized test scores, as well as improvements in working memory. What’s more, Dr. Sara Lazar, a neuroscientist at Massachusetts General Hospital who studies mindfulness meditation, previously told HuffPost that regular meditation may stave off the thinning of the brain’s prefrontal cortex, and in turn declines in cognitive function, later in life. Builds self knowledge. According to a 2013 article published in Perspectives on Psychological Science, mindfulness (defined as “paying attention to one’s current experience in a non-judgmental way”) can help people to understand their own personalities. “For example, one who overestimates the positivity of his or her personality or status is often disliked by others, whereas having insight into how others perceive the self and acknowledging one’s flaws seems to attenuate the negativity of others’ impressions,” the researchers wrote in the study, as previously reported by HuffPost. Improves empathy. A small study from Emory University showed that a compassion-based meditation program, called Cognitively-Based Compassion Training (CBCT), might help people to read others’ facial expressions, HuffPost reported when the results were released in 2012. “These findings raise the intriguing possibility that CBCT may have enhanced empathic abilities by increasing activity in parts of the brain that are of central importance for our ability to recognize the emotional states of others,” senior author Charles Raison said in a statement. Improves depression. The 2014 review of 47 randomized trials, published in JAMA Internal Medicine, showed that mindfulness meditation can be effective in easing depression for some patients, as well as anxiety, HuffPost previously reported. The researchers wrote: “Anxiety, depression, and stress/distress are different components of negative affect. When we combined each component of negative affect, we saw a small and consistent signal that any domain of negative affect is improved in mindfulness programs when compared with a nonspecific active control.” And depression has been linked with other serious health conditions, including heart disease. Physically changes the brain. University of Oregon Research released in 2012 suggested that one type of Chinese mindfulness meditation could be associated with physical changes in the brain — ones that might help stave off mental illness, HuffPost reported when the findings were released. Fosters a healthy body image. Australian research published in Clinical Psychologist suggested that being mindful (which can be cultivated through mindfulness meditation) may be linked to having a healthier relationship with food and your body, Berkeley’s Greater Good reported. Helps sleep. Research presented at the 2009 Annual Meeting of the Associated Professional Sleep Societies suggested that meditation could be helpful in the treatment of insomnia. “Results of the study show that teaching deep relaxation techniques during the daytime can help improve sleep at night,” principal investigator Ramadevi Gourineni, M.D., director of the insomnia program at Northwestern Memorial Hospital in Evanston, Ill., said in a statement. Plus, a University of Utah study released last year showed a connection between mindful personality traits and improved sleep quality. Check out four meditation techniques for improved sleep here.